I am so ready for Memorial Day! 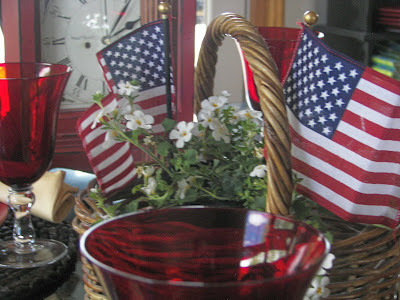 I just love the old red, white, and blue and summertime! When I first moved to Utah I was surprised at how many flowers are put on graves -- it really is a pretty sight! It's almost that time of year again....yeah! It's the official start of summer. The last day of school for my kids is tomorrow! Yahoo! I am ready after the last week of two band concerts, two piano recitals, two dance rehearsals and a dance concert. It's "time" to start thinking about Memorial Day! I found these plates at Target quite a few years ago. 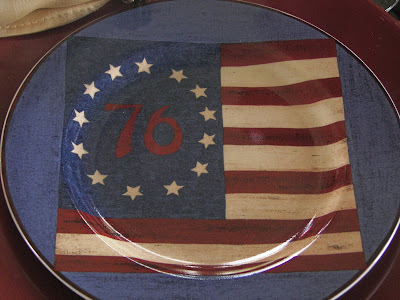 They are called "Spirit of Flag" plates designed by Warren Kimble for Brandon House. I bought eight dessert plates. Each plate has a different historic flag pictured. This plate is called the "Birthday Flag." The second plate I will show you is called "The New Millennium Flag." I set the table with my ruby goblets. I love how the light shines through them. I put some Bacopa in a basket. It is one of my favorite outdoor summer plants. A good view of the candlestick? An angle shot of my tablescape. I think that there is nothing more American than baseball and Baby Ruth candy bars NOT inspired by the "Babe." Click on HERE to read about the naming of the Babe Ruth candy bar. Please take one or two candy bars before you leave. Thanks for stopping by! Stop by Between Naps at the Porch to see wonderful and inspiring tablescapes. The table looks fantastic. Love those flag plates! Great table Joni- it screams summer! I can't believe your kids are done already! Wow! When do they go back?? I'm with you about Memorial Day, July 4th, all the summer and patriotic holidays. Your table is wonderful, festive, and inviting. Also very inspiring. I'm starting to think about my Memorial Day table. I've been on the hunt for some cute items for my Memorial Day tablescape that I'm doing next year. I love your plates and how you put everything together. Great job. Wow! Your kids get out of school early where you live. Here in CA they still have another month to go. Our kids are out tommorrow too! 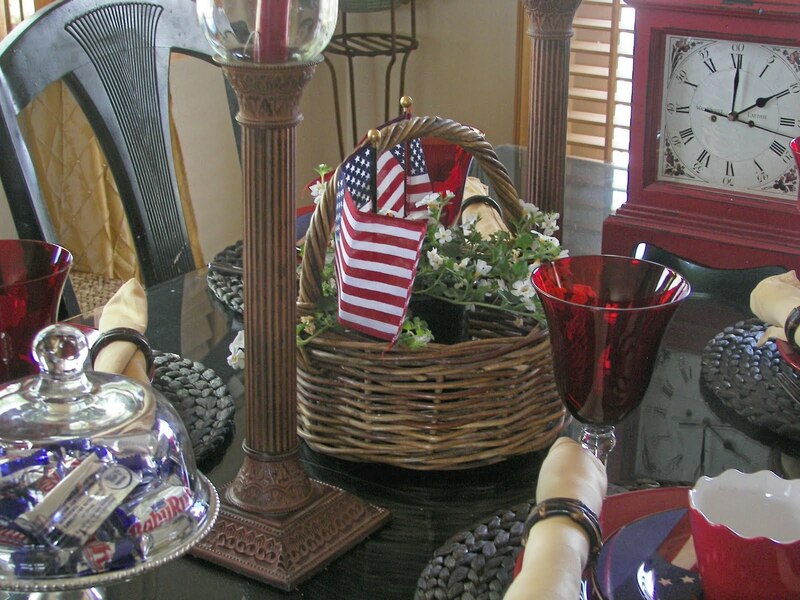 I love this tablescape I am a sucker for patriotic decor! This is great. I have those flag plates!!! 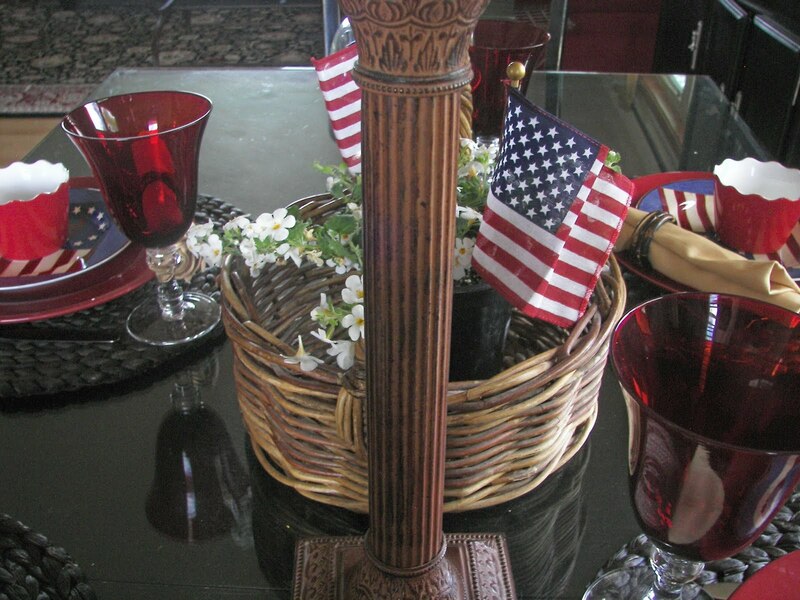 Love them...my house is filled with flags and the red white and blue...I really enjoyed your tablescape! Great job on this Memorial Day tablescape! I am having my Centerpice Wednesday party today come by and join in the fun. Link back too. Joni, The flag plates are fabulous! 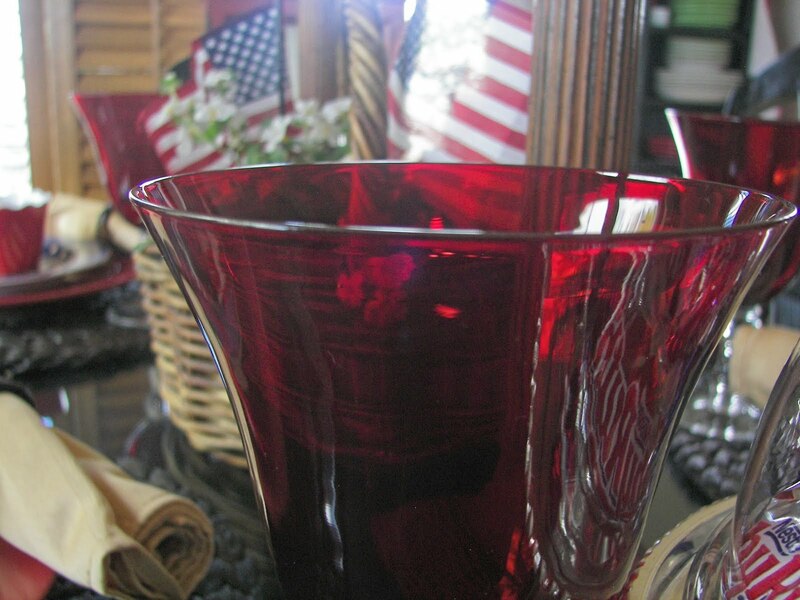 Love the ruby goblets too! This is a very pretty table for Memorial Day - fire up the grill!!! You set a great Memorial Day table. I too love the red, white and blue. I get goose bumps when I see our town put out all the flags on this kind of holiday. They were out for Armed Forces day last week. Hope its sunny on the 31st so I can photograph them. Thanks for sharing. You can't go wrong with red white and blue any time of year in my book! Love your patriotic tablescape. What a cute table. 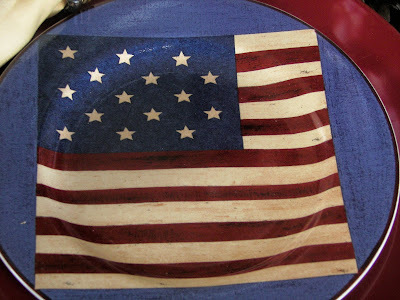 I love your flag plates! 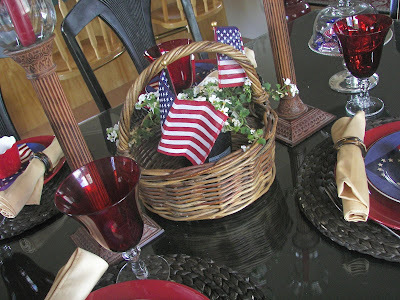 Joni, I love this snazzy patriotic tablescape! It's as cute as can be. 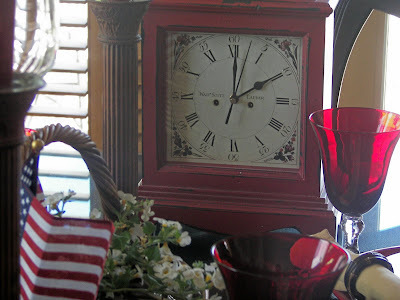 I just adore your flag plates and those red goblets and how you brought in that cute red clock! Great job! What a pretty table! I hope you have a great time this weekend! Joni, thank you for your visit and the nice comment. So I discovered your blog. Those flag plates are very nice. And for Memorial Day just as if they are made for it. All looks very nice. I like the lights in the ruby goblets. Great table. Looks great, I love to bring out the red, white and blue! Lovin' the red glasses! This looks great! Red, white and blue always looks good. I love the way you included the Baby Ruth bars. I love your patriotic table, there is nothing quite like the red, white an blue! love it! Makes me want to do my patriotic wreath and get it up quickly. 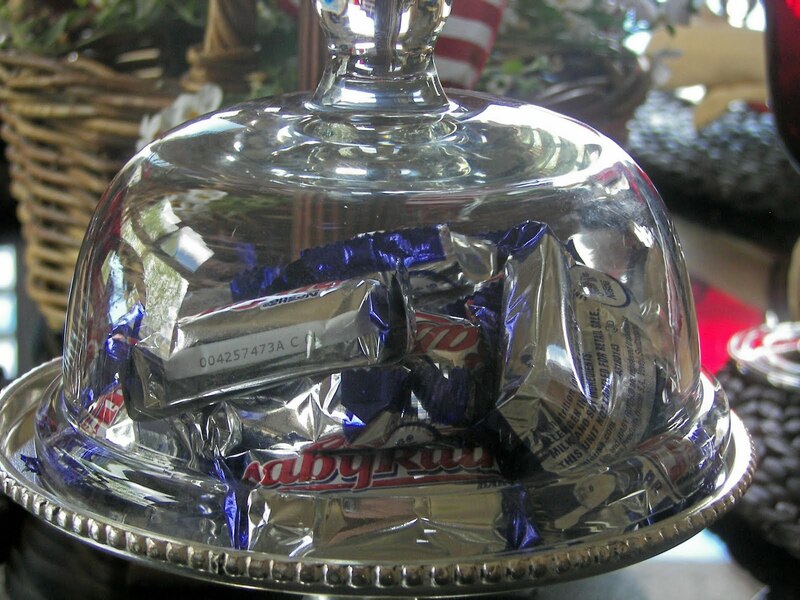 I have star glass bowls to use for my table! Fun! What a festive table! I love those ruby glasses with the flag plates -- gorgeous! And I love the touch of whimsy from the Baby Ruth bars! Thank you for the creative ideas! 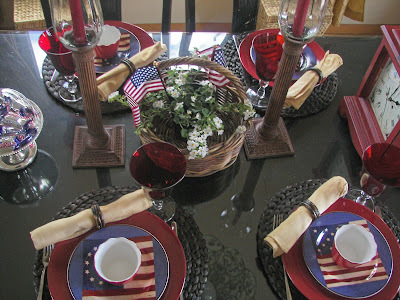 My very favorite red, white and blue color scheme is reflected in your beautiful tablescape!!! Love each and every item especially the Baby Ruths...a perfect touch!!! Hopped over from That Old House. Love your holiday setting! Simle but very flattering. You've got my favorite red, white and blue-with baseball and candy bars you can't go wrong! Thanks for sharing this delightful table with us. I'll be watching for more! Love those red glasses! They are gorgeous. Never thought of Babe Ruth candy being patriotic, but I love it...all I need is an excuse! That's one of my favorite candies (as it that flower! ).